The timing couldn’t be better. In 1 Kings 3, Solomon ascends Israel’s throne after his father, David. He goes to worship the Lord and asks for wisdom, for the gift to discern between what is right and what is wrong. The timing couldn’t be better, for if you think it’s bad now it’s gonna to get worse. In just a few weeks, it’ll get even noisier. The Republicans are going to meet in some city and the Democrats in another. They’ll have a great big rallying cry, and we’ll be overwhelmed with campaign promises, attack ads, and reasons to vilify one and love the other. It’s going to get worse, much worse. That’s why it’s particularly nice to think about Solomon’s wisdom. Would that more public servants appeal to God for wisdom. Would that more who enter the fray of politics pursue humility, grace, and a desire to serve the common good, above all else. The timing is quite perfect, indeed. Let’s look for a moment at Solomon. He shows wisdom with that whole baby-splitting episode, so good for him. Yet it should be noted that when he asked for wisdom he was already king, so it’s not like he needed more wealth or power. And Solomon has an interesting track record as king. Whereas his father, David, was a charismatic builder – the one who gathered the formerly tribal-minded people into one nation, expanded the kingdom, and was beloved by all, even in spite of his less-than stellar behavior – Solomon didn’t have his father’s grace and statesman’s touch. Over the course of his rule, Solomon built the grand things David didn’t: that magnificent and costly Temple, for one. Solomon expanded Israel’s power even more than his father, marrying countless women as part of his international relations with local kings and princes, pursuing wealth and prestige beyond the borders of Israel. Solomon taxed the people heavily, forced them to work unceasingly, and nearly broke their backs. By the time Solomon died, the divide and animosity in the kingdom was so great that he was the last monarch of the unified country – thus was Solomon’s inability to remain wise, humble, and gentle. 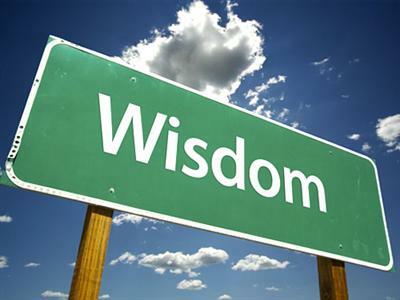 Even the one who humbly prays for wisdom doesn’t wind up having it. I don’t mean to say that seeking wisdom is not good practice; rather, it is. I’m suggesting that that’s not enough. I suspect that once you enter that world and get seduced by power and privilege and wealth and prestige it’s really hard to look back and remember those other values of humility and grace, the care for the common good and looking out for the little man. This happened, no doubt, to Solomon as he was entertained in the courts of his day. This happens in every state capital and in our nation’s capitol, today, as fresh-faced lawmakers, intent on doing good, also get led down a rosy path. Desire to serve and intent to remain wise is just not enough. God saw all of this, in time, and God grew frustrated. God gave us everything – minds to think, and hearts to love, and hands to serve; resources and opportunities and desire; all the right tools and perfect moments to make His kingdom come on earth, as it is in heaven. And we squandered it and messed it up, time and again. So God grew frustrated, but also remembered He’d never again destroy this creation, hence the rainbow in the clouds. So God determined to re-write history, and re-order the path of human life. God did a most unexpected and radical thing, and came upon earth as one of us. And that’s what they remembered, years after He was gone. They remembered how close they were to Him and how close He was to them; how intimately He knew them. They knew that they wanted to do nothing more than root their lives in Him, and feed on him and drink from his life so that they may have the only thing worthy of being called real life. God lived as one of us and became human so that humans can become divine. God re-oriented the whole of human history and rooted Himself in the world so we would root ourselves in Him, and cease to look beyond or outside or to another for answers again, but within — in that deepest, holiest place where the Kingdom dwells already, made sacred when He became and thus blessed our nature. That’s the lesson in its fullest truth: that when God become human, redemption already happened. And the path to new life is to be rooted in Him, the one who became rooted in our experience, as well. Now, pause. And return with me to the world beyond the Body of Christ. As those Republicans meet in Tampa and while the Democrats meet in Charlotte in the weeks ahead, the danger is that you and I will come to believe their messages – that you and I might start believing, somewhere in our heart, that so-and-so has the right idea, and that good intentions lead to good results and, subsequently, that the opponent is a nasty person with awful, no good ideas that will tear down this nation and everything we value. And you might not only believe those things but you’ll let it infect your lifestyle and your relationships, and you’ll get opinionated and cranky and stop getting invited to cocktail parties. Don’t let that happen, to you or your life or your heart or your relationships. Don’t let that happen for it’s a losing game. The answers are not outside. The answers are not in another’s good intentions, and the fault isn’t that other one’s bad intentions. Rather, root yourself where God chose to be planted – in our very flesh and blood, where there is already the food and drink of real, unending, worthwhile life. It’s within you already, which is where the promise is already offered … in you.